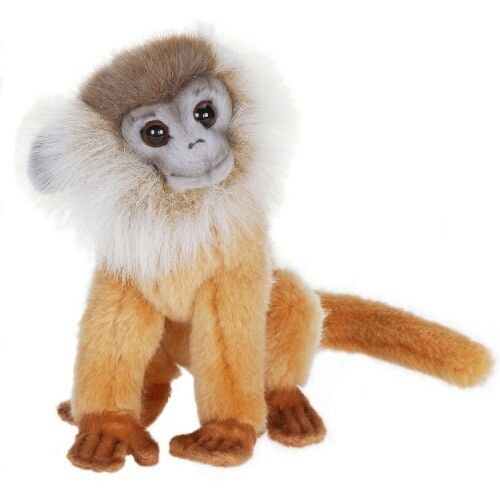 This 7" tall leaf monkey is the perfect size for the car ride home, and you don't even have to go to Malaysia, Sumatra, or even Borneo to find this one. This leaf monkey is brown and orange, but the adult is a silver leaf monkey (also known as an Old World monkey), recognizable by their grey-tipped, dark brown or black fur that gives them a silvery look. Voted as one of the cutest monkey in the jungle, this leaf monkey fits perfectly in the smallest of arms as well. Leaf monkeys are medium-sized primates with long tails and diverse coloration. The coloring of nearly all the young animals differs remarkably from that of the adults. Most species are arboreal (tree-dwelling), although some live a more terrestrial life. They are found in many habitats of different climate zones (rain forests, mangroves, mountain forests, and savannah), but not in deserts and other dry areas.